Here is Buster Bear, my first mini jointed teddy bear. I am pleased with how it came out and quite surprised on how easy it was. I am anxious to try it on other Amigurumi now and see the results. How lovely! I especially love his standing up pose in our flickr group – it looks like he’s dancing to Staying Alive! he is soooooooo cute. I’ve never tried to do a jointed animal. I like the one that makes it look like he is waving! He is so cute. I’m like Val…I haven’t ever tried to do a jointed one. I’ll have to give it a try sometime. 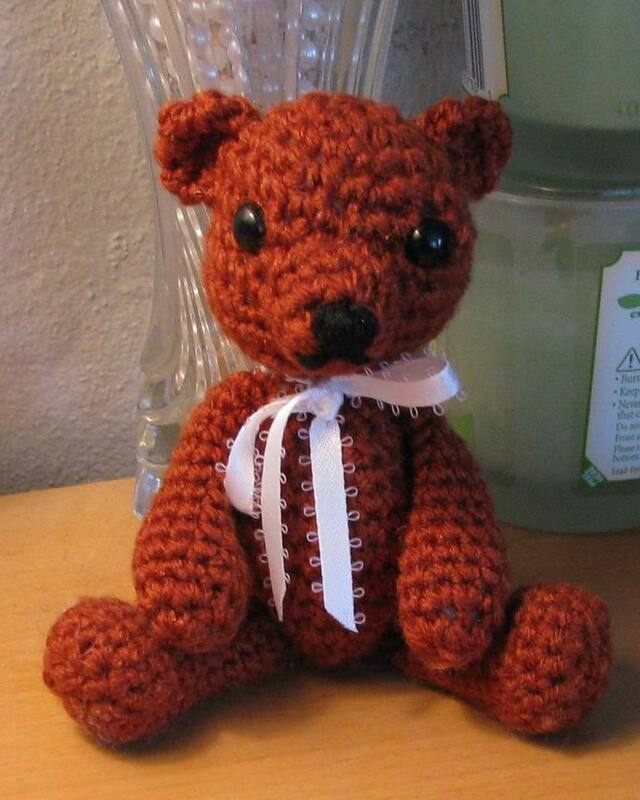 I would like to find the pattern for Buster Bear to crochet. I love the way he came out. This is so cute! I wish I knew how to do this. I’m new to crochet. I look at these patterns and they look like gibberish to me. I hope one day I can do something like this. Cute bear!! Is the pattern listed here? Would like to try to make one.